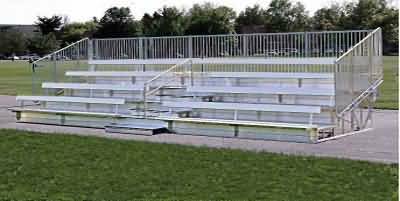 Our closed deck bleachers have all open spaces that are normally present on any aluminum bleacher set closed off. This allows the bleachers to be placed indoors and not have to deal with trash accumulating under the set. 4 row 19.5' Closed Deck Aluminum Bleachers with Back seats 41. Our closed deck series provides an additional level of comfort for spectators not found in standard bleacher types. The closed deck assures nothing falls under the bleachers that will later need to be cleaned out. Each row has a back incorporated onto the seat for a much more comfortable seating experience. Aisle and handrail makes these bleachers easy to get in and out of. With our aging population its worth it to have comfortable spectator seating so all can enjoy our local sporting events. Closed deck bleachers are also great for indoor use in gymnasiums. If you would like a quote on a set of closed deck bleachers let us know let us know by clicking the contact form below.